YONKERS, NY – May 23, 2018 – Yonkers Mayor Mike Spano today announced his appointment of Senior Associate Corporation Counsel, Matthew Gallagher, to the position of Corporation Counsel for the City of Yonkers. Gallagher will replace the recently departed Michael Curti, who served as Corporation Counsel for the City since 2012. Gallagher, the Senior Associate Corporation Counsel under Michael Curti since April 2014, has been vital to the City’s eight collective bargaining agreements under Mayor Spano’s tenure, along with the handling of litigation and contract negotiations involving the City of Yonkers. He previously served as Legislative Counsel to the Westchester County Board of Legislators, as well an Assistant County Attorney in the Westchester County Attorney’s Office. Gallagher began his career at the Law Firm of Grunert, Stout & Bruch after graduating from St. Francis College and Pace University School of Law. Mayor Spano’s appointment of Matthew Gallagher as Corporation Counsel will be presented to the Yonkers City Council for final confirmation in the coming weeks. Yonkers Mayor Mike Spano and Yonkers City Council will re-name the corner of Stockbridge Road and Middleboro Drive in the City of Yonkers “Michael Nolan Way “on Thursday, May 24 at 1:15 PM, in honor of Yonkers resident Michael Nolan. Yonkers resident Michael Nolan was tragically killed by gunfire in Yonkers in 2015. James Nolan Jr., brother of the late Michael Nolan, as well as parents Donna and Jimmy, have been strong advocates at the city, county and state level of Anti-Drag Racing legislation, along with Organ Donor awareness in memory of Michael Nolan. 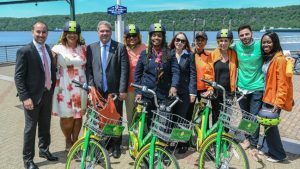 YONKERS, NY – May 21, 2018 – Yonkers Mayor Mike Spano and Lime today launched the New York City area’s first dock-free bikeshare program at a kick-off event with local transportation advocates and community leaders. Mayor Spano and Lime officially “unlocked” the bikes and demonstrated how Yonkers residents will now be able to enjoy an affordable, reliable and fun way to get around the city. “We are excited to offer the residents of Yonkers a mobility solution that’s affordable, reliable, convenient, and fun,” said Gil Kazimirov, Lime New York General Manager. “As we work together, we look forward to the community-wide benefits in Yonkers of getting more residents on bikes, and we hope this partnership is just the beginning of expanding access to equitable transportation in the region. Lime’s sustainable system not only provides affordable first and last-mile transportation solutions; increased bike use could greatly enhance quality of life in Yonkers due to decreased car emissions and a healthier form of travel. Yonkers’ commitment to helping residents live healthier and more environmentally friendly lives is what drew Lime to partner with the city. Lime will join Yonkers at a time when they are also teaming up with 511NYRideshare in becoming a Clean Air NY Community Partner—linking residents to a free ridematch program and offering resources and information for residents to go ‘green’ on their daily commute. Mayor Spano and representatives of Lime were joined by members of 511NYRideshare, Yonkers Bike Club and Yonkers Creating Healthy Schools & Communities at the launch. Currently available in more than 60 markets, Lime is the leading American smart mobility company in the nation. All its bikes are GPS and 3G-enabled, making it simple for riders to find, unlock and pick up a nearby vehicle using their smartphone. When the ride is finished, riders simply end the ride with the Lime mobile app and responsibly park by the street curb, or at a bike rack. Lime is revolutionizing mobility in cities and campuses by empowering residents with a greener, more efficient, and affordable transportation option that also improves urban sustainability. By partnering with local key stakeholders and systematically deploying a fleet of smart-bikes and scooters that are enabled with GPS, wireless technology, and self-activating locks, Lime will dramatically improve urban mobility by making the first and last mile faster, cheaper, and healthier for riders. Since launching in June 2017, the company has logged over 3 million trips, expanded internationally to Europe, and deployed electric scooters, electric-assist bikes, and multiple models of their standard pedal bike. Funded by Silicon Valley’s leading VC firm Andreessen Horowitz, Lime is based in San Mateo, CA. Learn more at limebike.com. Yonkers Mayor Mike Spano will welcome a group of three War Veterans to Yonkers City Hall on Wednesday, May 16 at 11:00 AM to present Distinguished Service medals and certificates honoring their service, sacrifice and bravery. The group will be participating in the Hudson Valley Honor Flight, an all-expense paid day-long trip to the Washington, D.C. memorials, departing from Westchester County Airport on Saturday, May 19 at 6:30 AM. There will be a Welcome Home Rally for the Veterans at 7:45 PM that evening when they return. The Hudson Valley Honor Flight occurs several times a year from Westchester County Airport and is a local hub of the National Honor Flight Network. Hudson Valley Honor Flight (HVHF) is a 501c3 non-profit organization that transports Veterans to visit their Washington, D.C. memorials at no cost to them. Yonkers Mayor Mike Spano, along with Habitat for Humanity of Westchester, will gather for the first-ever “Mayor’s Build Day,” Wednesday, May 9 at 12:00 PM at 7 Moquette Place, Yonkers to celebrate Habitat for Humanity’s service to the City of Yonkers the past two decades and to kick off the reconstruction of the property. The Yonkers home at 7 Moquette Place, currently being rehabbed by Habitat for Humanity of Westchester, will be given to a Yonkers Veteran later this year. The property was in tax arrears and Yonkers City Council voted to donate it to Habitat for Humanity. The City of Yonkers and Habitat for Humanity have worked in partnership together since 1997, restoring homes, community gardens, and providing housing for those in need, including returning veterans. Habitat for Humanity of Westchester is celebrating 30 years of service in Westchester County. YONKERS, NY – May 7, 2018 – Crestwood, one of Yonkers’ 38 neighborhoods, has been recognized by popular real estate research website Zillow.com as one of the nation’s most popular and sought-after neighborhoods for house shopping. Crestwood ranks as the 17th most popular, the only one in New York State and one of only three neighborhoods on the east coast. According to Zillow.com, homes in Crestwood experience 5,822 page views per house listing, compared to 365 page views for the typical U.S. home, and has a median listing price of $559,735. Crestwood/Yonkers, NY and Paradise Park/Oakland, CA are the only neighborhoods in the top 20 with homes listed under $1 million. Located in northeast Yonkers, Crestwood borders the Bronx River Parkway and the Villages of Tuckahoe and Bronxville. Crestwood is home to Metro North’s Crestwood Train Station on the Harlem Line and is located 30 minutes from midtown Manhattan. The New York Times once described Crestwood as an ‘old world in a big city’ when featured in October 2011. The complete study of Zillow.com’s Most Popular Neighborhoods can be found here. At the end of each day, Zillow takes a snapshot of all the active home listings on the site and records how many times each home was viewed. A database is mined to yield the neighborhoods with the highest number of page views per listing from January 1 to March 31, 2018. Only neighborhoods with at least 10 for-sale homes during that time were counted. Because listings often go through price changes, and to avoid counting the same property twice, the median of listings’ most recent list price within individual neighborhoods were taken. Zillow is the leading real estate and rental marketplace dedicated to empowering consumers with data, inspiration and knowledge around the place they call home, and connecting them with the best local professionals who can help. Zillow serves the full lifecycle of owning and living in a home: buying, selling, renting, financing, remodeling and more. Zillow operates the most popular suite of mobile real estate apps, with more than two dozen apps across all major platforms. Yonkers Mayor Mike Spano will join renowned artists during the City’s 5th Annual Yonkers Arts Weekend Saturday, May 5 and Sunday, May 6th at venues across the city. Yonkers Arts Weekend, Westchester County’s largest urban arts festival, takes place May 5-6, involving over 300 artists, sculptors, performers and musicians across four spectacular venues across the City. For more details and the complete schedule for Yonkers Arts Weekend, visit www.yonkersartsweekend.com or Yonkers Arts Weekly on Facebook. Yonkers Mayor Mike Spano will host a press conference in the City’s South Broadway Business District on Friday, May 4 at 11:15 AM at Silvio’s Italian Restaurant & Pizzeria at 351 South Broadway, to celebrate the culmination of National Small Business Week and the benefits of shopping and dining at local small businesses in the City Yonkers. Since 1963, the President of the United States has issued a proclamation calling for the celebration of National Small Business Week. This year, National Small Business Week was recognized from April 29-May 5. More than half of Americans either own or work for a small business, and they create about two out of every three new jobs in the U.S. each year. There are over a dozen small businesses in Yonkers that have been in operation for 100 years or more. Yonkers Mayor Mike Spano will join local and visiting artists and Yonkers Arts Weekend participants Wednesday, May 2 at 12:00PM on the 5th floor of 86 Main Street, to kick-off Yonkers Arts Weekend and to announce the weekend’s schedule of events and exhibits planned around the City. Yonkers Arts Weekend, Westchester County’s largest urban arts festival, takes place May 5-6, involving over 300 artists, sculptors, performers, designers and musicians across four spectacular venues across the City: the YoHo Open Studios at the Carpet Mills Arts District, Downtown galleries and mural paintings, Hudson River Museum, and Untermyer Gardens. For more details on Yonkers Arts Weekend, visit www.yonkersartsweekend.com or the Yonkers Arts Weekly on Facebook.